John Corigliano is one of America's most acclaimed composers. He's won a Pulitzer, an Oscar and five Grammys, and he's still hard at work, having turned 80 on Feb. 16. Corigliano grew up with stage fright, even when he wasn't the one taking the stage. His father, violinist John Corigliano Sr., spent 26 years as the concertmaster of the New York Philharmonic. Corigliano remembers many performances hunched over a loudspeaker in the green room of the philharmonic. He didn't dare to sit in the hall itself. "I was too nervous that he might make mistakes," Corigliano recalls. "And when the difficult spots were coming, I would hunch further." Corigliano's mother, Rose Buzen, was an accomplished musician herself. His parents were convinced he would never make it as a composer, so they did all they could to stop him. When he wrote Violin Sonata for his father in 1963, John Sr. refused to play it  until it won the Italy's Festival of Two Worlds in 1964. "Then it got picked up and played by the concertmaster of the London Symphony, and then Roman Totenberg played it in Boston, and then my father had to take it out of the closet where he put it," Corigliano says. "And he loved it. He played it for the rest of his life." Corigliano's anxiety didn't go away as he got older. "For many years, for like 20 years of my own composing life, I wouldn't be in the hall for the concert. I would be backstage or outside the hall. I just couldn't stand listening to my own piece," he admits. Even though he couldn't stand it himself in the beginning, Corigliano's music moves people. Justin Davidson, classical music critic for New York magazine, says Corigliano's best work is immediate and "urgent." "People respond to it with a kind of physicality," Davidson says. "It's got a visceral ability to connect." Filmmaker Ken Russell felt that connection. After hearing Corigliano's Clarinet Concerto, he invited the composer to step out of the concert hall and into a Hollywood studio to write the score for the sci-fi horror film Altered States. "He wanted me to be wild," Corigliano says. "So I experimented with a lot of things. … I had this incredibly good orchestra. These orchestras are some of the best in the world and I was able to do anything." 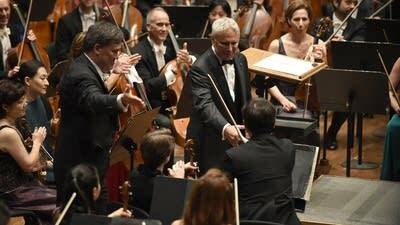 Not all the orchestra members were pleased with Corigliano's experiments. But one musician who soon became the composer's champion was conductor Leonard Slatkin. "John is an eclectic composer," Slatkin says. "He's not afraid to use many styles in his writing. He's also a colorist; he's able to use whatever instruments and vocal forces he has at hand to create new sound worlds." Slatkin conducted a Grammy-winning recording of Corigliano's First Symphony. The piece was the composer's response to the AIDS epidemic, with an opening movement titled "Of Rage and Remembrance." "That was a very painful piece to write," Corigliano remembers. "I realized I had lost so many people to this horrible, horrible plague, that I had over a hundred people in my address book that died." Over the years, Corigliano has proven his music can't be pigeonholed: He's written an opera, The Ghosts of Versailles, inspired by the story behind Mozart's The Marriage of Figaro, and a song cycle for Bob Dylan's lyrics called Mr. Tambourine Man. Currently, he's working on a saxophone concerto and another opera with a libretto by his husband, fellow composer Mark Adamo. With more than 50 years in the business, Corigliano still loves to compose … it just takes a bit longer. "When I was writing my early pieces, I did it in a hyper way because for me, composing was such a nerve-racking thing to do," he says. "Now, the whole note is my friend; an adagio is what I look for. And when I have to write a fast movement, I say, 'Oh my God.'"